Meet the King of Nightmares and his minions! Legends tell of a Man in the Moon. A great spirit that watches over people as they sleep and invites their sleeping minds to visit his beautiful land where dreams flourish and ideas are born within their minds. Everything is at once new yet timeless, bright but never blinding. It is a land built by imagination and fueled by hope. The wholesome dreams of people on Earth, especially children, cause the moon to glow at night. It's at those times, if you look closely, you can almost make out his smiling face shining on the moon's surface. But what the legends don't mention is that the Man in the Moon has a brother. A bitter and resentful spirit named Crepitus who seethes in his brother's shadow. Crepitus gains his power from fear and loss. He sends his minions to destroy healthy slumber with disturbing visions, and places dark ideas, doubts, and hopelessness within sleeping imaginations. Crepitus strikes when sleep is most easily disturbed, and draws sleepy minds into his dreary land of broken dreams. He is especially fond of tormenting children, always wanting them to stop using their imaginations and grow up too fast. 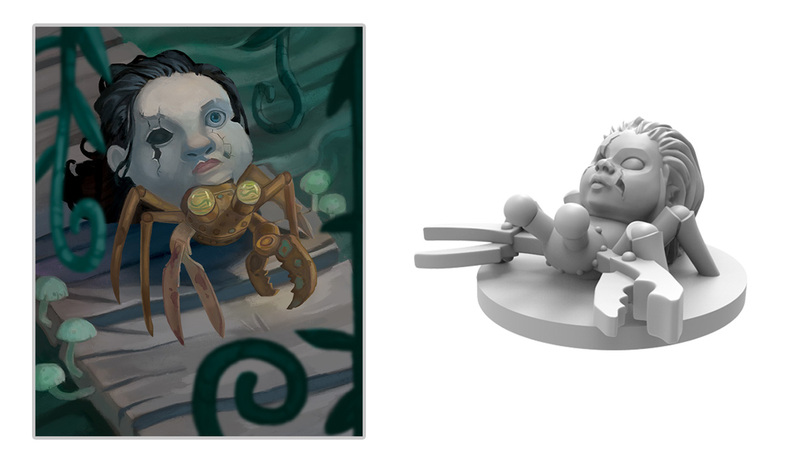 Welcome to this week’s preview for Stuffed Fables! 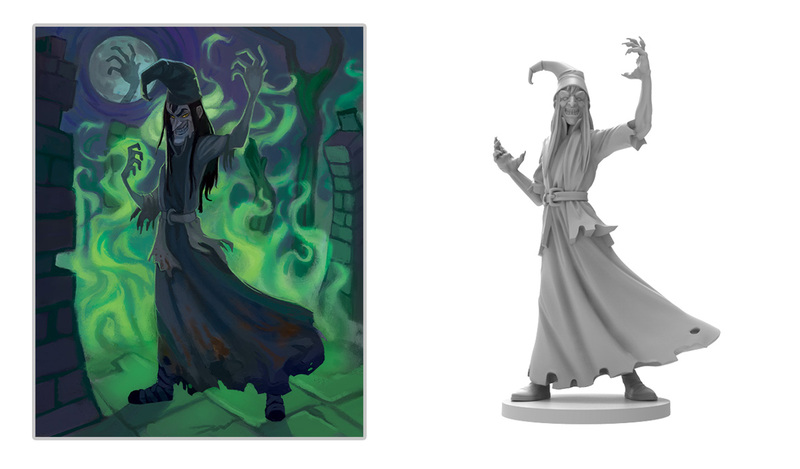 We will get to know a bit about Crepitus, the King of Nightmares, and the minions that do his bidding. Every great story has a villain - a character whose unwholesome passion for creating strife drives the heroes to rise to their highest potential in an effort to protect what they hold dear. In Stuffed Fables, that character is Crepitus. Now to be perfectly honest, Crepitus is just doing his job. His talents are opposite to his brother's, and while his brother’s world is bright and glimmering, Crepitus rules over a fearsome land called the Fall, and that is a place nobody would want to visit. The Fall is a land of perpetual dusk, populated by lost and broken toys. These refugees were discarded by children who grew up too fast, and who lost interest in their toys too soon. This is Crepitus’ domain, and in the center of it all is the giant toy factory-fortress where he resides. Most of the land is filled with broken childhood objects, but some of these toys, dolls, and stuffed animals arrive in the Fall simply lost or only partially damaged. 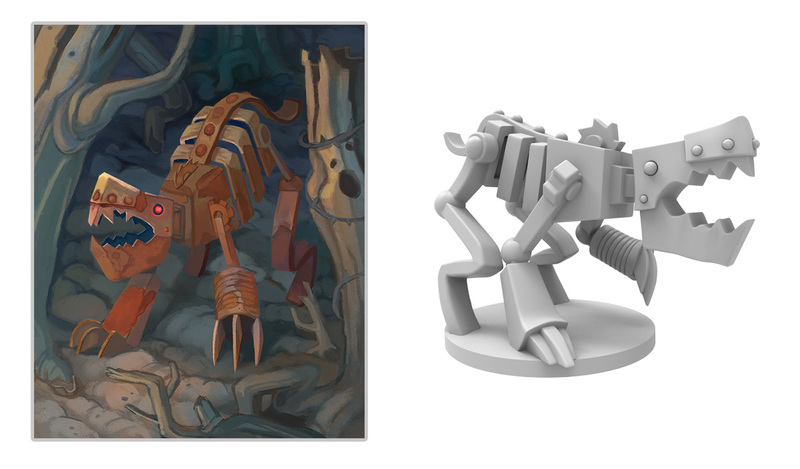 These toys are put to work in Crepitus’ factory, turning old broken toy bits into minions to do Crepitus' bidding. There are three basic Minion types in Stuffed Fables. Each Minion type also has a leader. Leaders are just like other minions, but have a different set of stats and behavior matrix. Let’s take a look. 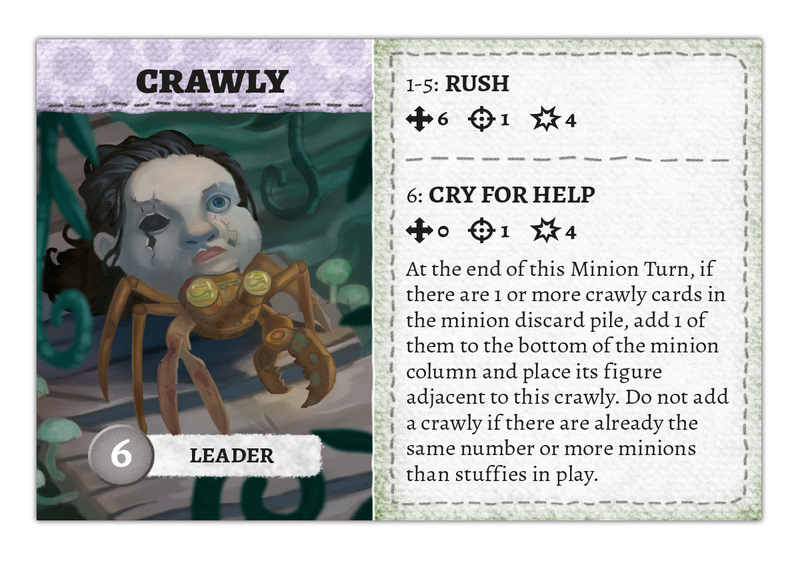 Crawlies are the weakest of the minions. They appear like mechanical hermit crabs that have made their homes inside of old discarded doll heads. In addition to disrupting sleep, Crawlies like to sneak into children’s rooms, and steal small objects and trinkets. A sock here, a marble there – perhaps even an old crayon. It’s the little things that Crawlies like. Who knows how many kids have been scolded for losing track of something, when in fact it was swiped by a greedy Crawly? Crepitus demanded the mongrels be designed as pets for his daughter, but she didn’t treat them well. Now Crepitus uses them to hunt any toys that defy his rule. Mongrels are fast moving and vicious, and can chew the stuffing right out of their victims. Their leader’s chilling howl will make a stuffy freeze in its tracks and lower his defenses. Dark Hearts are somewhat of a mystery to the stuffies, and just the sight of a dark heart can fill a stuffy with dread. Dark hearts appear to be stitched together from a variety of different stuffy parts, with one conspicuously missing piece: the essential plastic heart. They scare the stuffing out of our heroes with their haunting gibberish and spooky screeches. You might be wondering how these creatures behave when the stuffies encounter them in the game. Stuffed Fables has an easy and intuitive system for allowing each minion to behave independently. Two minions of the same type might act differently because each minion has its own script on its card. When the minions take a turn, you roll a die for each minion and consult it’s script to find out how it behaves. You can tell the minions apart because the shape of their base matches a shape on their card. Each minion type also has a leader. These will always have a round base, and have better stats and different scripts than the regular minions of that type. But What About The Bosses? 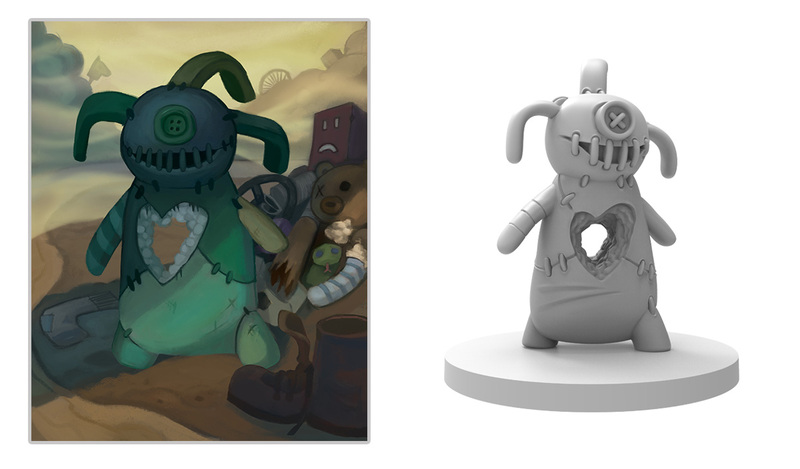 Stuffed Fables has bosses, each presenting a different challenge. However, these villains are introduced through the story and are not revealed to the players until they meet them. We won't spoil your appetite by divulging anything here! Grab your gang, and join the fight to protect a little girl’s sleep when Stuffed Fables hits the stores this December! Jerry Hawthorne is the designer of Stuffed Fables, Mice and Mystics, and other great games.